And so it begins...Moiraine and Lan lead Rand al'Thor and his friends out of the Two Rivers. Follow the break for the summary (and yes, this is the first time ever I've had to employ this on the blog, as the summary is quite long). Moiraine Damodred and Lan Mandragoran, searching for the Dragon Reborn, arrive in the town of Emond’s Field on Winternight, the day before the Bel Tine festival that celebrates the spring solstice. After asking some questions, Moiraine discovers that there are three young men in the town who had all been born within weeks of the Battle of the Shining Walls: Rand al’Thor, Matrim Cauthon and Perrin Aybara. Interestingly, both Rand and Mat’s fathers are skilled archers and, even more interestingly, Rand’s father disappeared to explore the world for some twenty years, returning with a new wife and a new son very early in 979 NE. Moiraine is almost certain that Rand was the one she is looking for, but can’t rule out the possibility that it is Perrin or Mat either. Moiraine is also startled to discover that there are many girls in the Two Rivers able to channel the One Power or able to learn, an indication of how long it has been since Aes Sedai last visited this area. The strongest channellers are Nynaeve al’Meara, a wilder (someone who has mastered the One Power without realising it) and village Wisdom, and Egwene al’Vere, daughter of the Village Mayor (Brandelwyn al’Vere) and Rand’s sweetheart. The peddler Padan Fain arrives with news of the false Dragon ravaging Ghealdan, which slightly panics the villagers since Ghealdan’s northern border is just across the White River to the south. The Mayor points out that between Ghealdan proper and the Two Rivers is the dense Forest of Shadows, where most people refuse to travel, and there is no reason for danger to reach the Two Rivers. A gleeman, Thom Merrilin, has arrived with fireworks to perform on Winternight and likewise dismisses the threat, claiming it was old news when he passed through Baerlon a few weeks ago. Thom recognises that Moiraine is Aes Sedai and recalling the fate of his own nephew takes an interest in Moiraine’s questions about the three young men. Rand and many other young men in the village (including Mat and Perrin) are slightly disturbed to find themselves being watched by cloaked figures. Rand and his father Tam return to the farm, but the farm comes under attack by Trollocs! Tam is wounded and Rand has to carry him on a stretcher to Emond’s Field. Rand is startled that his father is a skilled swordsman, wielding a blade marked with herons, the symbol of a blademaster. Along the way Tam falls into a fever, muttering about how he found Rand on the mountainside during a great battle. Rand dismisses it as the fever, but is still unnerved. Emond’s Field has also been attacked, but the Trollocs and Myrddraal concentrated their attentions on the Luhhan smithy (where Perrin is apprenticed) and the Cauthon household and caused little damage elsewhere. Moiraine and Lan drove off the Trollocs by using the One Power. Some of the villagers become angry, thinking that the Shadowspawn pursued the Aes Sedai here, but Moiraine defuses their fears somewhat by telling them of the fall of Manetheren during the Trolloc Wars and their ancestors’ noble stand against the Shadow. The villagers are moved, but not totally placated. Moiraine tells Rand and his two friends they should flee the village before the Trollocs return. Thom Merrilin attaches himself to their party, claiming that he doesn’t want to travel alone, and Egwene is also allowed to join them, surprising Rand, Perrin and Mat. Moiraine is impressed by Egwene’s potential strength in the Power and wants to take her to Tar Valon to be trained as an Aes Sedai. The party departs Emond’s Field by night and heads north up the road to Taren Ferry and beyond, to Baerlon and the rest of Andor. However, just outside the village of Watch Hill the party is attacked by a Draghkar. Lan drives it off and they reach Taren Ferry without further incident. Crossing the river, Moiraine uses the One Power to create an immense bank of fog stretching down the River Tarendrelle. With any luck, the Shadowspawn will think they fled downriver and be distracted. The party proceeds northwards. Along the way Rand learns that Egwene can wield the One Power and learn to be Aes Sedai. He is slightly disturbed. At Baerlon the news is all about the false Dragon Logain Ablar and his victory over the armies of Ghealdan and Altara. Logain has announced his intention to take Tear and the fortress which guards it. Thom tells Rand that the fall of the Stone of Tear will herald the coming of the true Dragon Reborn. Moiraine is disturbed by both news of Aes Sedai deaths in the battle, and also of a detachment of Children of the Light in Baerlon, pursuing rumours of an Aes Sedai in the district. Moiraine leads the party to a friendly inn she knows of. During the night Rand, Mat and Perrin share a dream in which a black-cloaked man with fire for eyes and mouth appears and taunts them, claiming to be Ba’alzamon (the Trolloc name for the Dark One, apparently). The next day an unnerved Rand and Mat set out to explore Baerlon and almost get into a fight with a group of Children of the Light, led by Captain Dain Bornhald. Rand also sees Padan Fain, but the peddler flees before Rand can get more than a few words out of him. Thom learns of Rand and Mat’s dreams and suggests they tell Moiraine nothing of them. Back at the inn Rand meets a young woman (though a few years older than Rand), Min Farshaw, who is an acquaintance of Moiraine’s. Min apparently can see vague impressions of the future in the form of auras surrounding people. Around Perrin she sees a wolf, a broken crown and flowering trees. Around Mat she can see a red eagle, an eye on a balance scale, a dagger with a ruby, a horn and a laughing face. 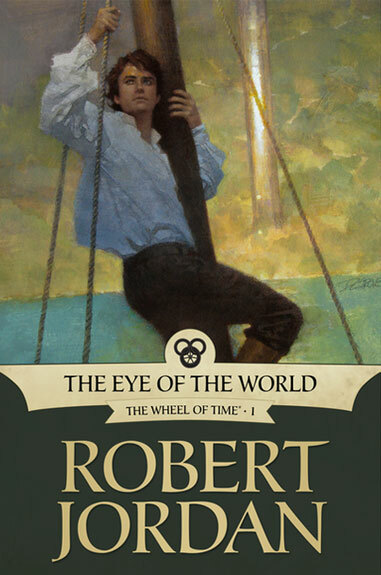 Around Thom she can see a man - not him - juggling fire and an image of the White Tower, which is odd. 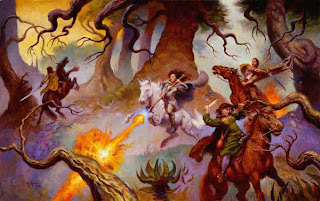 Rand plucks up the courage to ask about himself and learns that Min sees images of a sword that is not a sword, a golden crown of laurel leaves, a beggar’s staff, water being poured on sand, a bloody hand and a white-hot iron, three women standing around a funeral bier with Rand on it, and black rock wet with red blood. According to Moiraine, Min’s abilities are unrelated to the One Power - she cannot channel - but are instead ancient, lost abilities slowly returning to the human race after an absence of several millennia. In the inn Rand discovers that Nynaeve has arrived, having tracked them from home (impressing even Lan, who hid their tracks exceptionally well). Nynaeve initially demands that Moiraine return them home, but after learning her fears agrees they should go to Tar Valon. Nynaeve attaches herself to their group. That night Rand encounters a Myrddraal in a corridor and Moiraine decides they should leave, since the Shadow has once again picked up the scent. She leaves instructions for Min to travel to Tar Valon by herself at a later date and then flees with the others. At the gatehouse Dain Bornhald attempts to stop them for questioning, but Moiraine uses the Power to scare him off. Unfortunately, Myrddraal can sense the use of the Power and thus now know where their quarries are. After two days of fleeing eastwards Lan scouts ahead and reports that Shadowspawn are closing from both ahead and behind. Given that there is nothing southwards except the Hills of Absher and the Tarendrelle, Moiraine turns north. The group heads across-country, fighting off a Trolloc attack along the way. Lan estimates the pursuit force to number in the hundreds; there have not been so many Trollocs in this part of the world for over 2,000 years. Eventually they reach an ancient, ruined city. Moiraine claims they will not be followed inside. Once within the city they set up camp in an abandoned house and Moiraine tells them to take nothing from the city. The group enters the ruined city of Shadar Logoth. Mat feels restless and convinces Rand and Perrin to go exploring. In another part of the city they meet a man who claims to be a treasure-hunter, Mordeth. Mordeth convinces them to help him move some treasure, but then Rand notices that he doesn’t have a shadow. Mordeth suddenly erupts into a gaseous-like monster and the three young men flee. Back in their hiding place Moiraine reveals that this place is Shadar Logoth, the ruined city of Aridhol which fell to internal evil during the Trolloc Wars. Mordeth was the King’s counsellor and the man widely held to be responsible for the city’s descent into chaos and eventual destruction. According to legend Mordeth lives on in the city, as does a mist-like creature called Mashadar, apparently the evil and greed of Aridhol made manifest in some way. Lan returns from his scouting mission and reports that, with great difficulty, the Myrddraal have forced the Trollocs to enter the city and look for them. The party flees again, but Mashadar appears and splits them into two groups. All are then scattered by a Trolloc attack. Mat and Rand escape through the main gates and are joined by Thom. They find a boat, the Spray, moored on the River Arinelle and leap on board, waking the sleeping watchman, Floran Gelb. The captain, Bayle Domon, rallies his crew and drives off the Trollocs long enough to set sail downriver, despite Rand’s protests that they wait for the others. Domon agrees to give the three men passage to Whitebridge in return for coin and also for exposing Gelb’s laziness. He will be put off the ship at Whitebridge. Egwene and Perrin escape together, only to be separated at the river. They meet up the next day across the other side. Perrin suggests that rather than head downriver they go across country to Andor’s capital city, Caemlyn. Once there they should be able to find Moiraine and the others again. Egwene agrees. A few days later they meet a man in the wilds, Elyas Machera. Elyas is a Wolfbrother, a man able to talk to wolves telepathically. This is not related to the One Power and is more akin to Min’s abilities, an ancient human talent that is now returning. Elyas agrees to guide them to Caemlyn. Along the way he tells them that he was once a Warder, but had to flee Tar Valon when his abilities were discovered, since the Red Ajah believed he could channel and tried to kill him. Whilst crossing Caralain Grass they meet a caravan of the Tuatha’an or Tinkers and travel with them for a while. Nynaeve, Moiraine and Lan meet up again and proceed on foot to Whitebridge. Moiraine tells Nynaeve that she too can wield the One Power, but she has erected a mental block against being able to do it. This block, in Nynaeve’s case, is that she can only channel when angry. Nynaeve agrees to seek advice in the White Tower, unaware that Moiraine believes that she has the potential to be the most powerful Aes Sedai in more than a thousand years. Moiraine also reveals that coins she gave to Rand, Mat and Perrin are warded with the One Power, allowing her to track them even over several hundred miles. Two of the coins have vanished (given to Bayle Domon as payment) but the third remains active. Moiraine suggests they go after the two that have vanished and collect the third one when they have time. The journey to Whitebridge is uneventful for both groups. Thom trains Rand and Mat in the basics of being gleemen and finds that Rand can learn the flute and Mat is a good juggler. Whilst travelling downriver Bayle Domon tells them about many relics left over from the Age of Legends or even before: a silver tower near the river (they actually see it in the distance) with no windows or doors; a crystal lattice covering an island which hums in the moonlight; a spire reaching up from a circular valley in the Black Hills which can kill a man from a mile away; a great silver hand clutching a vast crystal ball, reaching out of a hillside on the Sea Folk island of Tremalking, and others still. Domon reveals that he collects artefacts from the Age of Legends, and is gloomy because Trollocs have been troubling him ever since he left Maradon in Saldaea. He doesn’t know why. Rand al'Thor on the Spray, with the Tower of Ghenjei in the background. Reaching Whitebridge, Thom, Mat and Rand depart (and are given their passage fee back, having entertained the crew so well that Domon will accept that as payment instead; he keeps the Tar Valon coins, however) and stop at an inn to catch up on the latest news. 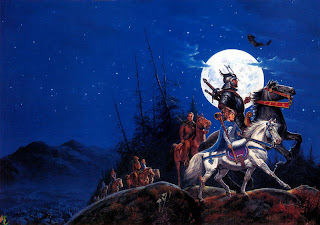 The barman tells them that a great battle has been fought near Lugard, the capital of Murandy, and that an alliance of southern nations led by Aes Sedai and consisting of Tarabon, Amadicia, Altara, Murandy, Illian, Tear, Cairhien and Andor has defeated the false Dragon Logain and taken him prisoner. He will be taken to Tar Valon for gentling, but will be paraded through Lugard and Caemlyn along the way. Rather unexpectedly, the Council of Nine in Illian has called the first Great Hunt of the Horn of Valere in more than 400 years. Adventurers and youngsters from across the West are heading to Illian to swear the oaths and become new Hunters. Thom asks the barman if he has seen any of their colleagues and the barman replies no, but others have been asking for them. Thom decides to leave the town immediately. He tells Rand and Mat that his nephew Owyn got into ‘trouble’ with Aes Sedai and died for it. He doesn’t want Rand and Mat to suffer the same fate, which is why he has helped them. Before they can exit the town gates and cross the White Bridge, a Myrddraal appears. Thom thrusts his belongings at Rand and tells him to flee, asking him to remember the name of an inn in Caemlyn, the Queen’s Blessing. He then suicidally attacks the Myrddraal. Rand and Mat escape under the sound of screams. Perrin, Egwene and Elyas travel eastwards with the Tinker caravan for some days. Perrin is disturbed by the Way of the Leaf, which he sees as noble but unrealistic and suicidal when faced with such dangers as there are in this world. Egwene is more engrossed by it, but reluctantly agrees with Perrin. Along the way the caravan’s mahdi (‘Seeker’ or leader), Raen, asks them to help him solve a riddle. Three years ago a Tinker caravan travelling in the northern Aiel Waste encountered a group of Maidens of the Spear - female Aiel warriors - slain in battle with Trollocs. The last surviving Maiden, before she died, claimed that ‘Sightblinder’ means to slay the Great Serpent and blind the Eye of the World. Sightblinder is the Aiel name for the Dark One, and the Great Serpent is the universally-accepted symbol of eternity, but the rest of it is nonsense. Their three guests cannot shed any light on the subject. Shortly after this they depart, heading southwards towards Caemlyn. Moiraine, Lan and Nynaeve pass through Whitebridge, finding a scene of devastation near the town gates but no-one willing to explain what happened. Purchasing new steeds, they head east along the Caemlyn Road towards the capital. Rand and Mat make good time on foot as they journey eastwards. Initially they sleep rough, or occasionally get a bed in return for helping out on a farm for the day. However, Rand then starts playing Thom’s flute and Mat juggles, allowing them to entertain in inns and private homes along the route. Rand is slightly worried when Mat reveals that he was given an ornate curved dagger with a ruby in the hilt by Mordeth and took it from Shadar Logoth despite Moiraine’s warnings (Mat points out that it was a gift and thus not taken from the ruins in the way Moiraine meant). Mat plans to sell it if necessary, but never does. Their journey is uneventful until they reach Four Kings, where an innkeeper tries to rob them of their belongings and also where a merchant from Whitebridge (and also a Darkfriend) tries to capture them. The inn is struck by lightning, allowing Mat and Rand to escape. In the next town, Market Sheran, a young Darkfriend confronts them but Mat denounces him and the youth is chased out of town by a mob. In the town after that a young woman tries to murder them whilst Rand is stricken by a fever, but is driven off by Mat and his dagger. After passing through Carysford they reach the last village before Caemlyn itself and see a Myrddraal trying to bribe a merchant into keeping an eye out for them. The merchant refuses, since the two men have done him no harm. Later, Rand and Mat approach him for a lift and he agrees. They reach Caemlyn the next morning. To hide the heron-mark on his sword and scabbard, Rand buys a red armband and ties it around his weapon. Reaching the Queen’s Blessing Inn, Rand and Mat meet the innkeeper, Thom’s good friend Basel Gill. Basel laughs at suggestions that Thom may be dead and tells them about how Thom used to be Court Bard at the Lion Palace, but was driven out of the city after arguing with Queen Morgase’s Aes Sedai advisor, Elaida do Avriny a’Roihan, about the unlawful gentling and death of his nephew. 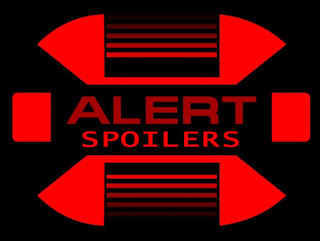 Rand suggests seeking Elaida’s protection until Moiraine arrives, but Gill points out that the Red and Blue Ajahs are rivals, and also that Elaida would hold any friends of Thom’s in great suspicion. Gill suggests they hide out in the inn and wait for their friends to arrive. Rand learns that there is friction in the city at the moment about Caemlyn’s long-standing alliance with Tar Valon. Those loyal to the Queen and who support Tar Valon wear red armbands, whilst those who oppose it wear white armbands and are egged on by a detachment of the Children of the Light under Lord Captain Eamon Valda. The crisis has been triggered by both the imminent arrival of Logain and also by the fact that the Daughter-Heir of Andor, Elayne Trakand, is soon to be sent to Tar Valon to be trained in the art of politics by the Aes Sedai, as all heirs to the throne of Andor have been for a thousand years. Her brother Gawyn will accompany her to be taught in the ways of combat by the Warders, for he will be her First Prince of the Sword, protector and commander of her armies when she is Queen. Their half-brother Galad Damodred will accompany them both to keep an eye on them. Apparently Elaida and the Aes Sedai have taken a keener-than-usual interest in Elayne, but for no obvious reason. Rand also meets Loial, an Ogier from Stedding Shangtai, who is staying at the inn. Though at 90 he is too young to be allowed out of the stedding, Loial wanted to see the outside world and has run away from home. Rand, instinctively trusting the Ogier, tells him about his adventures. Loial suggests that Rand and maybe Mat and Perrin are ta’veren, those special people who twist time and destiny around them in strange ways. Rand rejects the idea: he is no new Artur Hawkwing. Meanwhile, Perrin, Egwene and Elyas reach the ruins of a huge statue. Elyas tells them that is the great statue of Artur Hawkwing, erected upon the site where his new capital was meant to be. The statue, like all monuments of the High King, was torn down during the War of the Hundred Years, but is so huge that most of it remains intact. Over the course of their journey Perrin has begun to be able to talk to the wolves, and like Elyas his eyes have started turning yellow. Perrin is reluctant to embrace this new ability, but it is forced upon him when a group of Children of the Light attack. 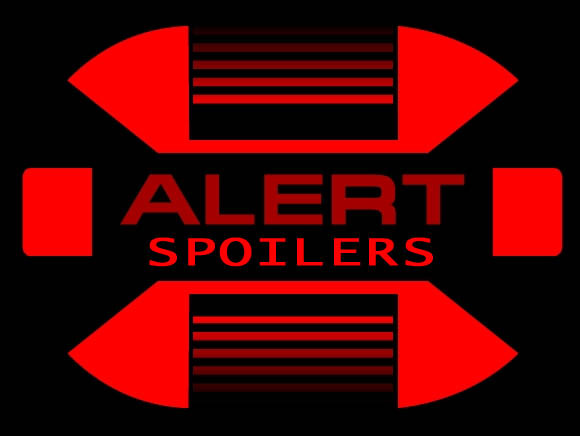 Elyas and most of the wolves escape, but one, Hopper, is killed whilst mind-linked to Perrin. Perrin goes into a psychotic rage and kills two Children before he is overcome. Egwene is also imprisoned. Lord Captain Geofram Bornhald (Dain’s father) and his second-in-command, Jaret Byar, tell Egwene that she may avoid execution, but for his crimes Perrin will be hung under the Dome of Truth in Amador. Bornhald has been recalled to Amador on urgent business, but plans to pass by Caemlyn along the way and learn news of events there. The day of Logain’s procession dawns and Rand goes to see the parade. Mat is ill with a fever and refuses to rise from bed. Reaching the crowd, Rand is suddenly accosted by a man in rags and runs off. Escaping to the tallest hill within the Inner City, Rand climbs on top of a wall to see the parade. Startlingly, he sees Logain look straight at him and start laughing. Rand is then startled by a woman’s voice and falls off the wall. Regaining consciousness, Rand finds himself in an ornate set of gardens. A young man and a young woman tend to his wounds and it is not long before Rand realises he has fallen into the Royal Gardens themselves! Elayne and Gawyn agree to smuggle him out of the palace, but he is discovered by Galad, who alerts the palace guards, led by Lieutenant-Guardsman Martyn Tallanvor. Tallanvor attempts to arrest Rand, but Elayne instead orders that he be taken before Queen Morgase. Morgase and her closest advisors - Captain-General Gareth Bryne and Elaida do Avriny a’Roihan, Aes Sedai of the Red Ajah - question Rand closely. Elaida doesn’t believe that Rand comes from the Two Rivers given his height and hair colour, but Morgase knows the accent of the region and identifies it in Rand’s speech. Elaida then has a Foretelling that chaos and fire will engulf the world and that Rand will stand at the centre of it all. Despite this prophecy, Morgase releases Rand since he has committed no crimes as yet. Before he leaves Rand learns that Elayne can channel the One Power and that is why the Aes Sedai are so interested in her; she will be the first ruler in more than 1,500 years to be openly Queen and Aes Sedai simultaneously. He also learns that many people take him for an Aiel because of his height and hair colour. Moiraine, Nynaeve and Lan approach Caemlyn, but then Moiraine senses the third warded coin blinking out (it is confiscated by the Children of the Light). She immediately heads for where she last sensed it and after a while comes across the Whitecloak camp. Under cover of darkness and using the One Power to create maximum confusion, she, Lan and Nynaeve raid the camp and rescue Perrin and Egwene. They escape to Caemlyn before any pursuit can be organised. In the Queen’s Blessing a few days later Rand is startled when a detachment of Children of the Light enter the inn and demand to know the whereabouts of two Darkfriends who have escaped Whitecloak justice. Basel Gill and his hired bouncer, Lamgwin Dorn, stare down the Whitecloaks and evict them from the inn. Then Moiraine and the others arrive through the kitchen and there is a joyful reunion, cut short when Mat suddenly tries to attack Moiraine with his dagger. Moiraine uses the One Power to Heal him of his infection, explaining that the corruption and evil of Shadar Logoth infested every single object inside Aridhol when it fell. Unfortunately, should even a pebble from that hated place be carried beyond the walls, then Mordeth will be made free to terrorise the world again. Mat has been infected by Shadar Logoth’s evil, but Moiraine has Healed it somewhat. However, the full breaking of the bond between him and the dagger can only be done in Tar Valon itself. The group swaps news and Moiraine learns about the incident in the Aiel Waste between the Tinkers and the Maidens of the Spear. The Eye of the World is a special, secret place in the uttermost north, in the Great Blight itself. Bordermen seek it in the same way southerners search for the Horn of Valere. A threat to the Eye cannot be ignored. Loial then tells her that twenty years ago, after the Aiel War, a refugee was granted safe haven in Stedding Shangtai for some months. During that time, in a fever, he said that the Dark One wished to destroy the Eye and time itself. Rand, reluctantly, admits the truth of his dreams and that in one of them Ba’alzamon said the same thing. Moiraine decides that the weavings of the Wheel have brought three different accounts of the same threat to her at the same time for a reason, namely that she should investigate personally. But the Blight is more than a thousand miles and a month’s travel away, and the danger now seems urgent. She asks Loial to guide them through the Ways. The Ogier protests about the dangers of Machin Shin, but eventually caves in. The trip through the Ways takes two days, but they emerge near the great fortress of Fal Dara in Shienar, near Tarwin’s Gap. Lan is convinced that someone is following them, but he cannot find them by backtracking. At the Waygate in the ruins of Mafal Dadaranelle Machin Shin appears to block the gate, ending fears of pursuit. The party proceeds into the keep, where they are welcomed with honour by Lord Agelmar Jagad, inarguably the most respected general alive, as well as the second-most-powerful man in the Kingdom of Shienar. Agelmar knows both Moiraine and Lan well, and tells the others of how Lan is the Uncrowned King of Malkier and the story of that nation’s destruction fifty years ago. Agelmar has grave news: Trolloc raids have increased along the entire length of the Blightborder, paralysing Saldaea, Kandor and Arafel as they prepare for an invasion. However, Shienaran scouts have discovered a truly vast horde of Trollocs gathering beyond the Mountains of Dhoom, aimed at Tarwin’s Gap and Shienar. Though Agelmar has sent riders to the other rulers, it seems that only the armies of Shienar will ride forth to confront the Trolloc threat this time. Moiraine remains convinced that the true danger is at the Eye of the World and even convinces Agelmar, who goes as far as to suggest taking the Shienaran army with Moiraine’s party. Moiraine dissuades him by pointing out that a smaller party has a far greater chance of success in reaching the Eye undiscovered. A man is captured whilst trying to sneak into the city and Moiraine discovers it is Padan Fain. He is dressed in rags and Rand recognises him as the man who chased him in Caemlyn. Obviously he chased them through the Ways, but how he evaded Machin Shin as well is unclear. Moiraine has him locked him and plans to deal with him when - if - they return from the Blight. Moiraine and the group fight their way through the corruption of the Blight. They set out northwards. After crossing the Blightborder they enter the foulness and corruption of the true Blight. After a few days they pass the shattered ruins of the Seven Towers of Malkier and the once-beautiful Thousand Lakes, now poisoned and inhabited by foul creatures. Camping for the night in sight of the ruins, Rand overhears Nynaeve confessing that she has feelings for Lan, but Lan pushes her away, telling her he will make no woman a widow when he inevitably dies in the Blight. The party approaches the Mountains of Dhoom and the High Passes that will carry them beyond, but then Worms appear and begin chasing them. Just when it seems they will be overcome the landscape shifts and they find themselves in a beautiful garden full of living things. They have passed through some dimensional warp and entered the domain of the legendary Green Man, keeper of the Eye of the World (in reality Someshta, last of the Nym). The Green Man is confused about his own history, but is aware of what others are not. He greets Rand as a ‘Child of the Dragon’ and calls Perrin a Wolfbrother. Moiraine tells him of the threat to the Eye and he takes them to see it. The Eye is hidden in a cave in the side of a hill. Moiraine tells them that the Eye of the World is the pure, untainted essence of saidin. It was created by fifty of the last remaining sane male Aes Sedai during the earliest days of the Breaking of the World, and then somehow cleansed by fifty female. Though they died in its making, they achieved the impossible and managed to partially cleanse the Dark One’s taint on saidin. The amount of energy stored in the Eye could level a large city if not handled with care, which is why it was hidden here. The party emerges from the cave to be confronted by two men, one withered and ancient and the other hiding his face behind an iron mask. The ancient one claims to be Aginor and introduces his comrade as Balthamel: two of the Forsaken! The Green Man appears and wrathfully commands them to leave his sacred place. When they refuse he attacks Balthamel and kills him, though in the process is slain himself. Moiraine distracts Aginor with the Power, allowing Rand and the others to flee. Aginor pursues Rand, telling him triumphantly that he is ‘the one’. Suddenly energy swirls around Rand, the energy of the Eye of the World. Aginor is annihilated in a firestorm and Rand is suddenly transported by the Power to Tarwin’s Gap, where the Shienaran army stands on the brink of defeat. Again the Power is unleashed and a mountainside collapses, burying most of the Trolloc army and forcing the rest to retreat. Rand then hears a thundering voice telling him that he must do what must be done; the owner of the voice cannot intervene again in the struggle the world is facing. Then Ba’alzamon appears to challenge Rand to combat. Rand wins, not by slaying Ba’alzamon but by severing a strange cord of energy that seems to be coming from him. Ba’alzamon vanishes and Rand finds himself back in the Green Man’s garden. He is horrified that he managed to channel the One Power, but only Moiraine, Egwene and Nynaeve saw him vanish and reappear. Egwene and Nynaeve agree to keep his powers a secret, but Moiraine’s intentions are unclear. Re-entering the Eye’s cave the party discovers that the Eye itself has vanished, burned out in Rand’s struggle (though only Moiraine and Rand work this out). Underneath they discover three items, apparently hidden along with the Eye. One is a flag made of a material unknown to any but Moiraine, a material used in the Age of Legends. The banner depicts a dragon roaring. It is the Banner of the Light, the personal flag used by Lews Therin Telamon during the War of the Shadow. The second is a golden horn marked with the legend The Grave is No Bar to My Call, meaning it is none other than the Horn of Valere itself. The third item is a circular disk made of cuendillar or heartstone, indestructible by even the One Power. The disk is emblazoned with the ancient symbol of the Aes Sedai from the Age of Legends, the Dragon’s Tooth and the Flame of Tar Valon embracing one another. Moiraine identifies it as the First Seal of the Dark One’s prison. Horrifyingly, the seal is shattered into several pieces. Rand thinks the Dark One is dead, but Moiraine guesses otherwise. The party returns to a Fal Dara celebrating a miraculous victory over the Shadow. Lord Agelmar receives the party in honour and makes them guests of honour at a feast, guessing their triumph is related to the larger victory. Later, Moiraine questions Padan Fain and learns that he is a ‘hound’ for the Dark One, sent to sniff out the location of one man. However, in Shadar Logoth he somehow bonded with the escaping essence of Mordeth and became something less than human. In the Ways Fain/Mordeth encountered Machin Shin and somehow absorbed part of that entity’s essence as well. Now Fain claims to be utterly opposed to the Dark One and dedicated to its destruction, but he is prone to rantings and ravings. Moiraine leaves orders for him not to be released. Rand confesses his fears to Egwene and Nynaeve, who still claim that they will keep his secret. Meanwhile, using the Power to eavesdrop on their conversation, Moiraine laments, "The Prophecies will be fulfilled. The Dragon is Reborn." I've been careful to avoid reading these WOT posts as I haven't read the series yet. That said, I've been seriously considering giving it a go lately. Would you recommend the series to someone who isn't already invested in it? I normally agree with your reviews and therefore would appreciate your opinion. I know all about people's opinions in that the middle books are slow but is this slightly less of an issue now that the series is nearly complete? Ultimately, what I'd really like to know is; am I missing out by not reading WOT? It's a solid series, but I think more impressive if you are less familiar with the genre and have not already read the likes of Martin, Erikson etc. Coming in at a later point, it will probably be less effective, though things like the worldbuilding and magic system are very well-done. You can only gain from reading this series to be honest. I started to read the first book over 10 years ago on a whim, and I fell in love with it. The amount of detail and the staggering amount of amazing set pieces and story really make these books stand out. If you enjoy fantasy, give them a try, they are very worth it.